Kimi would not have stayed with Ferrari had he felt he wasn't given equal support and equipment. This whole unequal treatment thing in Ferrari is a myth that didn't make sense. "I'm not really sure why they have gone with that tyre," Hamilton said. "They must be confident. Either they know something we don't or they have made a mistake. "We will find out tomorrow." DR??? He has buy-out option in his contract. Bottas ?? He was given a 1yr extension on contract. Carlos Sainz,?? Give him the right tool, I think he will deliver good results. I was also shocked we went to the US. But if we went with the same strategy then we cant beat them so maybe thats why we chose the US? If it’s cooler conditions SS is the right tyre. On pace wise on both tyres Ferrari were strong in fp2. Taking all those above conditions into play, I think they opted for it. 2nd stint on SS with low fuel is > 2nd stint on US with low fuel in cooler conditions. Example : Q2. It wasn't a myth when Michael was there...he was clear-cut #1 but that is b/c he was comprehensively better than all his teammates. Ferrari has never, in my life, been a team that cares for the WCC over the WDC. They have always put their chips behind the #1 driver. Teams like Williams and McLaren always claimed the opposite and tended to act as they claimed. RB pays lip service only to the idea, and Merc too I believe. When Ferrari won the WCC in 1999 it felt like a consolation prize b/c Michael had a car that year that he could have won the WDC with had Eddie not put him into the wall at Silverstone. When Michael came back at the end of the year it was only to help Ferrari to win that WCC b/c no way in the world he was going to help Eddie win the WDC, which is what Michael had been building the team towards when he joined in 1996. I keep comparing this year and Ferrari's driver pairing to 1998 b/c Michael had to battle both McLarens that year essentially by himself. Eddie wasn't good enough to assist him to a WDC...Eddie's results in 1999 were the result of a great car, not Eddie's ability. Ferrari needs a driver like Reubens who can win a race and take points off the title rivals like he did in Germany in 2000. Bottas is like Reubens in 2000. Kimi was a very good/almost great driver, once, though he's never been as consistent as you would like to see from the F1 greats...now he is just too slow. Arguing otherwise is being blind to reality now. I am not referring to Kimi. I'm OK with Leclerc as long as he is allowed to race and not put in any sort of supporting role because of his youth, lack of experience etc. Well said, plus in the MSC era with Ferrari, along with MSC's phenominal talent (dry and wet) the cars were very dominant....so a #2 could be right behind MSC. But that is well gone and in the past and we do not operate in such a way now. I still think these tyres have a small effect on benefiting mercedes, even if ferrari were caught out on bad setups, losing out in aero development race/suspension etc, RB would be much closer as seen at montreal, max was about 0.2s slower back then and now theoratically 0.8s slower on this circuit and ferrari 0.6s slower. Last edited by mwk360; 23rd June 2018 at 20:47. I know some of you might not be German National Team fans but I'm hoping Germany's last minute win today pumps Vettel up for tomorrow's race. cars, I said as in plural, from 1999 to 2004 where it took both the cars and drivers to win 6 WCC titles straight. Were not dominant though apart from 2 seasons, you seemed to suggest the cars were always dominant so any no2 would be right behind MS, which was not the case really. That's pretty dominant in my book. Yeah so as I said 2 years dominant when any no2 could be behind MS. The rest we needed the talents of MS to win titles so not quite sure what you are laughing about? You forgot 99 as well......Did you watch any of those seasons or just look at wiki? Look where Rubens finished in 2000,2001 and 2003 and tell me again we had dominant car all those years....no we had Michael. yep, I watched them.....never kept stats though. Did you keep stats back then?? you have your opinion of what dominance is and I have mine. Two dominant cars with 1 dominant driver and a #2 whom Ferrari picked who had talent to drive them: "not just any #2 driver." The percentages prove otherwise given said years. Of course Rubens was beaten in those years and yes I did watch those races. Still though, 4th place or 3rd place helps doesn't it for the WCC title???? Austria 2002 tells it all! "Hey Rubens, relax, your getting paid and you drive for Ferrari!" Now we have Lewis, 75 poles so far !! who is breaking every record in F- Pirelli; formerly F1, But Merc seems to let Bottas have a little fun also. The same goes for RB, Max lets Dan race! WCC counts big time. It's just a little tough when a fan has a favorite driver and different favorite team . So WDC and WCC !! Last edited by Brembo; 23rd June 2018 at 22:15. Austria 2002 tells it all! "Hey Rubens, relax, your getting paid and you drive for Ferrari!" Now we have Lewis, 75 poles so far !! who is breaking every record in F- Pirelli; formerly F1, But Merc seems to let Bottas have a little fun also. Bottas came in 3rd place in 2017 and guess where Bottas stands currently???? 3rd is'nt so bad when you're gunnin for the WCC title. Makes sense when 2 opposing #1's are gunnin for the WDC title. 1) these tyres really are favouring mercs a lot than other teams like RB & Ferrari. They quickly get into working range & pump a lap after a lap with further improvement. 2) If it’s only the power, they took the example of their customer teams. No one is into the q3, infact in top10 standings 5 cars are Ferrari powered. 3) Also amus reported, only Spain & France mercs has front row lock out. Both the drivers looked comfortable, in general one of them used to struggle with softer tyres. But this isn’t the case. 4) There is a rumour in the paddock that, mercs wantedly pushed its engine upgrade to France. So as to showcase that it’s the engine upgrade that got them to this position not the tyre advantage else there would have been much talk about the tyres again saying it’s favouring mercs team. 5) Amus also mentioned that it will be interesting to see where’s these mercs quali in Austria when Pirelli bring back original tyres & again compare it with Silverstone. All in all, to be precise these new tyres are really favouring mercs not the engine. Engine alone doesn't allow you to complete the lap, you need a good aero as well. Force India and Williams have crap aero whereas Haas has very good one. Sauber in 8th was due to efforts of Leclerc. Mercedes old engine in Canada was already faster than Ferrari's upgraded one as proved by Bottas' laptime. And Niki Lauda confirmed here that this upgrade is worth 2 tenths in qualifying. 4-5 tenths gap to Ferrari is correct. Ferrari have solved tyre issue, Vettel said his long run pace on Friday was quite good, despite running old spec engine in less power mode. 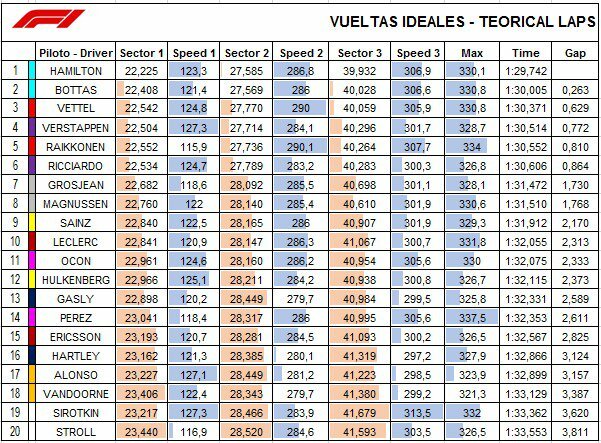 So tyres have nothing to do with it, Paul Ricard is a power track + new Mercedes aero and engine upgrade increased the gap from 3 tenths to 5 tenths.